US cake maker Dawn Food Products has extended the line of Weight Watchers Sweet Baked Goods it produces under licence from weight management company Weight Watchers. 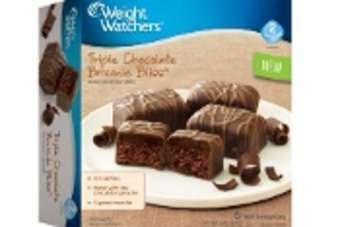 The company has introduced two products to its range: Weight Watchers Triple Chocolate Brownie Bliss and Peanut Butter Brownie Bliss. The chocolate brownie contains 80 calories and the peanut butter variety contains 90 calories. The products join Dawn Food Products other Weight Watchers products, including chocolate, lemon, carrot and red velvet creme cakes, chocolate brownie, coffee cake, cookies and muffins. JACKSON, Mich., Sept. 5, 2013 /PRNewswire/ -- Weight Watchers Sweet Baked Goods is excited to introduce Weight Watchers Triple Chocolate Brownie BlissTM and Peanut Butter Brownie BlissTM, two new products that started hitting store shelves in August. A decadent brownie layered with creamy, real chocolate ganache and a chocolaty coating. Each individually-wrapped brownie is 80 calories and has a PointsPlus® value of 2. An indulgent brownie layered with creamy, real peanut butter and a chocolaty coating. Each individually-wrapped brownie is 90 calories and has a PointsPlus® value of 2. Both varieties of Brownie Bliss contain zero grams of trans fat. They join other Weight Watchers Sweet Baked Good products including Chocolate, Lemon, Carrot and Red Velvet Creme Cakes, Chocolate Brownie, Coffee Cake, Cookies and Muffins. Consumers can find the new products at select national and local grocery retailers for a suggested retail price beginning at$3.29. The Weight Watchers Sweet Baked Goods lineup consists of Chocolate, Lemon, Carrot and Red Velvet Creme Cakes, Chocolate Brownie, Coffee Cake, Cookies and Muffins. With emphasis placed on great taste, Weight Watchers Sweet Baked Good products help consumers live sensibly while enjoying the sweeter side of life in a portion-controlled offering. US: Candy group Russell Stover "on the block"